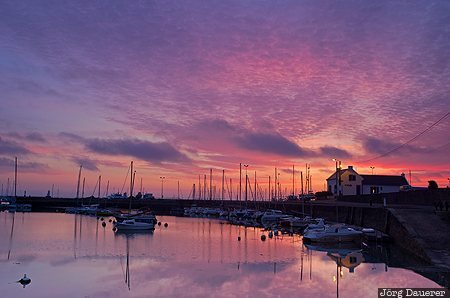 Boats below a colorful sunrise sky and the perfect reflexion in the calm water of the eastern harbor of Port-Haliguen in Quiberon in the early morning just before sunrise. Quiberon is a narrow peninsula in southern Brittany (Bretagne) in the north-western part of France. This photo was taken in the morning of a sunny day in May of 2011. This photo is part of the exhibition Colorful Sunrise (October 2013). This photo was taken with a digital camera.